Know your forgotten aadhaar number and enrollment number with your name and date of birth and phone number too. its good idea for people who lost the details. How to get details by using enrollment number? Dear candidates, you should following basic details to get more details. If Mobile or email Not linked to Aadhaar Number. just go for Mobile no update option. or else read the full article and decide what you want to do Now! Note: you cannot download without EID or Aadhaar number. (But you can know these details by Name, email, Mobile Number ). First of all, you have to visit this official website eaadhaar.uidai.gov.in. Note the mobile number that you offered at the time of enrolment is essential for this process. Now, you can select the aadhaar number or enrollment ID. Then, this is a time to you can enter the security code as well as click on get OTP. You will get an SMS on your register mobile number or an email. It contains an OTP. Enter the password as well as you will get the aadhaar number on your mobile or email. Hence, this is the simplest process to get the UID card or enrolment by using online process. yes! you can download now by name and date of birth and phone number etc. but you have to follow little more step, that is knowing your aadhaar number. Now you can get details by phone number. Now residents can get forgotten either Aadhar Number / UID or EID Enrolment identifciation Number. To download or know status without uid number is now possible. okay,But We need exact name and either email id or Phone number which are registred with enrollment centre. if we unable to retrieve with name and phone number. then we can also check / verify registred phone number and email id with uid resident serivces section. then follow then opt for additional services. case 2: Unable to find your Details; don’t worry just go to any nearest permanent center tap your fingerprint then access your data. Don’t forget to comment below to know how much help you. I guess now download by name and date of birth causes identity theft. for the better option as mentioned above or go to the nearest enrollment center. case 3: Some illiterates may not provide the phone number and email for those better to visit permanent enrollment center. Retrieve aadhaar number with Date of birth & name. uid card details by number /(adhaar / Enrollment / Name / date of birth. you may get an idea to Search aadhaar records of Indian residents. But every Indian citizen their data only. not other using the above details. First of all, there was no ideal tracking system to check the status by name earlier. but you can do this following some additional step mentioned below. visit UIdai Self service update portal SSUP, https://resident.uidai.gov.in/find-uid-eid. Enter either Aadhar Number or enrollment Number along with name, email, Mobile Number details. But this way at least one Id required. 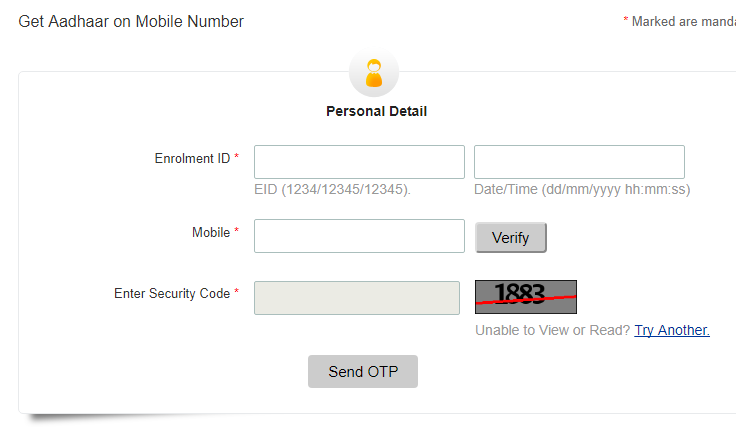 After entering the details you will get Aadhaar / enrollment number in your Mobile By SMS. Once you got the Details by Name and Mobile, you may go for download or status correction services. How many of you Paid for enrollment? it’s crime! Question 1: Is there any way to know aadhaar number by name? N0, You cannot do, without Aadhaar or enrollment Details. you can download by aadhar number. Question 2; how to get aadhar card number without enrolment number? then go to find UID / EID Option In uidai Portal. With only 1 Mobile Number along with the Full name. you can download without enrollment number. Question 3: how to update Mobile no in aadhar card? No documents required for this, this can be done at either online or enrollment center. for this we must know these details Full name and email or Mobile Number. Then can get details from above particulars. Sometimes we don’t know exact name or date of birth. I have aadhaar, No problem! My mobile already linked, My Luck! Oh yeah! my email enclosed last option. if none of the above Just go to the nearest enrollment center. don’t pay them because already govt paying (100+INR for 1 person). There you can update know status fresh registration etc. 0.0.1 How to get details by using enrollment number? 1.0.1 Don’t forget to comment below to know how much help you. what is my addhar card no.